Opportunity to specialize in your field of interest - graduate study allows you to focus your studies on topics that particularly interest you. Opportunity to expand your skill-set - after the BS in ECE, your graduate degree could be an MBA, an MD, a degree in Law or a PhD. Opportunity to earn a higher salary - on average, engineers with a Master's degree receive a 15% higher starting salary, compared to a BS graduate. Those with a Ph.D. degree can expect even higher earnings. Rowan ECE offers two graduate programs, a new Ph.D. in Engineering with specialization in Electrical and Computer Engineering, and a MS in Electrical and Computer Engineering, which consists of research track (with thesis) and professional track (courses only). Electrical and Computer Engineering Department is now offering a Ph.D. in Engineering program with specialization in Electrical and Computer Engineering that consists of a unique and innovative curricular structure. Rowan's Ph.D. Program is a terminal degree program that is specifically designed to meet the changing needs of researchers, scholars and scientists in academia, industry, and the government. The primary goal of this program is therefore to prepare students for careers in research and/or academics by providing an environment that closely reflects the realities and expectations encountered by today's academicians, professional scientists and research engineers. The program is designed to offer a highly flexible inter and multi-disciplinary curricular structure, allowing specialization in any (or multiple) of the traditional or emerging engineering disciplines. The primary strength of the program is involving students in activities that they are most likely to encounter in a real-world academic or industrial settings. At least one approved graduate level Math class. Certain math intensive engineering courses may be used to satisfy this requirement (3 credits). Effective Teaching in Academic and Corporate Environments (3 credits). Strategic Technical Writing and Winning Grant Proposals (2 credits). At least 18 course credits (not including Effective Teaching and Strategic Technical Writing courses) must be obtained from graduate only classes (600-level classes, or 500-level classes with no corresponding 400-level equivalent offered at the same time). A minimum of 21 credits must come from "Research." Up to 9 Research credits may come from ENGR 599 (MS level research). Students who complete their Master's degree elsewhere will be considered to have taken 9 credits of ENGR 599. All remaining Research credits must come from ENGR 699, the last 3 of which must be taken during the semester in which the Ph.D. Candidate plans to take his/her Ph.D. Dissertation Defense. All additional courses to be taken will be determined jointly by the student and his/her Ph.D. advisor (the Advisor) based on the specific area of interest, research and career goals. Courses offered by one department (under any of the Specializations) will, in general, be available to students in any Specialization, as long as they fit the aforementioned goals. All Ph.D. students will be required to complete all research compliance training required by the University for any research active employee. Regular attendance and participation in (0-credit) graduate seminars (ENGR 01.600 ToughTalk: Graduate Seminar) will be required for students for each Fall and Spring semesters they are in the program. This course will be graded on a Pass/Fail basis. CPRE will have four components in i) teaching, ii) grant writing, iii) publishing, and iv) service, each with its own requirements of diversity in that category. Specifically, teaching experience will require teaching at least 2 classes covering lower and upper level courses; grant writing experience will require small and medium / large scope proposals; publishing experience will require both conference and journal publications; and service will require students to be actively involved in a relevant professional society and serve at least twice on appropriate department / college level committees. Details are provided below. Successful completion of a Ph.D. qualifier examination within the first 2 years of the program. Successful defense of a candidacy exam, defending a Ph.D. proposal, twelve to eighteen months after the qualifier exam. Successful defense of the Ph.D. dissertation. Students will conduct research in emerging areas for addressing unsolved and open problems in electrical and computer engineering, and leading to a dissertation and successful defense of the dissertation. Effective Teaching: The candidate will take a new class called (ENGR 01.601) Effective Teaching in Academic, Corporate, and Government Settings discussing effective ways and best practices in providing technical content at a higher education or corporate / government setting. As part of this course, the student will be assigned to a professor in his / her home department (as an apprentice) to follow in and out of class to learn about the art of teaching, and allow him/her to learn different teaching / learning styles, teaching pedagogy, as well as conflict resolution and responding to a variety of situations that may arise in the course of teaching in a college or corporate setting. During this apprenticeship period, the student may teach the recitation / lab portion of the class, but will not be responsible for preparing lecture material. Once this class is completed, the student will be given primary teaching assignments, appropriate with his/her interests and skills. Each student will be expected to teach at least two classes - one at lower and one at upper level, under the College of Engineering'Äôs Teaching Fellow program. Students interested in an academic career may request additional teaching appointments. Grant Writing: The students will be expected to learn the art and science of grant proposal writing and application. This will include a course, ENGR 01.602: Strategic Technical Writing and Winning Grant Proposals, whose final deliverable will be a formal conference / journal paper (to be submitted for publication) and an actual small size professional grant application. After completing this class, the student will be expected to write one more proposal, medium or large in scope, in which the student may act as a PI or Co-PI (if the sponsor allows, or participate in advisor's application, otherwise). The proposal may be academic research, industrial research or development depending on the applicant's future career interests. Publishing: At least four published conference papers, one published journal paper (beyond MS) and at least one additional journal paper submitted (under review or published) will be required to satisfy the publishing requirement of CPRE. Depending on the nature of the research or publication venue, this requirement can be modified by the student's Advising Committee. 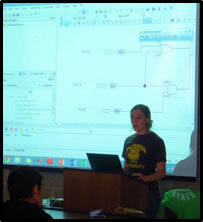 The ECE department at Rowan University offers two different tracks, both leading to the MS in Electrical and Computer Engineering degree. The program details can be found in the MS in ECE Program Guide and Overview [link] and below. This track is designed for those who are interested in developing an expertise within a specific area of focus within Electrical and Computer Engineering. To develop such an expertise, students in Research Track perform a rigorous research, supervised by an advising professor, on a specific topic of interest to solve a previously unsolved problem. The outcome of this research culminates in a MS thesis. Students who would like to excel in one of the areas of electrical and computer engineering, or those who are considering pursuing a Ph.D. one day, typically choose this track. Students who are accepted to this track are often eligible for research assistantships or teaching fellowships that can reduce or eliminate the out-of-pocket cost of the graduate education (see below for more details). This track is designed for those who are not interested in research or writing a thesis, but rather interested in expanding their breadth and depth of ECE knowledge by taking a larger number of courses in a wide spectrum of electrical and/or computer engineering fields. Students in this track do not work on a thesis, and take 30 credits of courses, which his typically 10 graduate level courses. While this is a course-only track, students who wish to obtain some research experience may choose to work on a smaller-scale project that can be count-ed for 3 credits (or 1 class). At least one of the electives must include significant use of computing or programming. A approved graduate level computer science class may be used to satisfy this requirement. An independent mini research project can be used to replace one of the 8 electives. Submit at least two printed and bounded copies to the ECE department. Be an admitted, matriculated full-time and active student in good standing in the program. Register for at least 4 consecutive terms (for MS students). Commit significant hours each week of each term to academic research under the guidance of their Advisor/Program Coordinator/Research Supervisor. 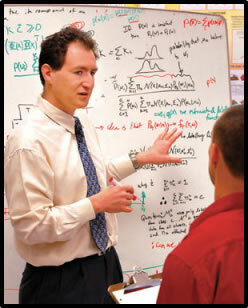 Work with faculty members on research projects leading to the Master's thesis. Submit the additional hiring paperwork listed within the Fellowship Agreement. Commit additional hours each week of each term to academic research. Teach two 3-credit courses within their first four terms of enrollment as agreed upon with their academic program/department. Full details about the student costs, funding provided, and all expectations and responsibilities required of Fellows are included in the official Graduate Fellowship Agreement Form, which can be obtained from the department or from CGCE Academic Services. Fellowship Agreements are subject to change due to changes in funding availability. No university or department-sponsored fellowship is available for MS students after students have reached the 30-credit limit. Completion of a Bachelor's degree in electrical or computer engineering or a related area from accredited institution of higher education. Minimum cumulative GPA of 3.0 (on a 4.0 scale)or better; or a minimum of 3.2 in-major GPA, or be in the upper 10% of graduating class. Completion of foundation courses: Chemistry I, Physics I, Calculus I, II, and III, Linear Algebra, and Differential Equations. Two letters of recommendation (three for the Ph.D. program) describing your ability to undertake rigorous graduate level work. Typewritten statement of professional objectives. Current curriculum vitae or resume - Students applying to the PhD program should also be able to show sufficient demonstration of independent research skills (advanced course projects, papers, presentations, thesis, etc.). a minimum TOEFL score of 79 on the internet based test (IBT). Corresponding scores for the paper and computer based tests are: 550 (PBT), 213 (CBT). International students who have received their undergraduate degree from English speaking countries will be exempt from TOEFL requirement. An admission committee member may also require an interview (in person, over the phone, or over the Internet, as appropriate and feasible). A GRE exam is NOT required, but encouraged; however, GRE scores will be used in evaluating the applicant should the applicant choose to provide these scores. Students are particularly encouraged to submit GRE scores if they believe their academic background is stronger than what is implied by their GPA. Applicants for the PhD program are also encouraged to submit GRE scores. Note that the above is an abbreviated list, including academic requirements only. For complete admission requirements and the application process see the MS in ECE Program Guide and Overview and go to MS in ECE Information and Application Page to apply. Any Rowan student who completes his / her B.S. degree in Engineering with a GPA of 3.5 or higher; or completes his / her M.S. in Track 1 (research option with thesis) with a GPA of 3.3 or higher will automatically qualify for the PhD program.